In the "powder room." i thought this was nice because the compound bow, orange hat and fur hat and puffy jacket are all lined up. 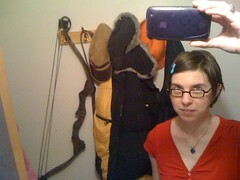 i am wearing my red shirt and blue necklace and blue barrette for the fourth of july.